Jeen and I met up for dinner last friday at Marmalade Cafe. Ordered the Oceanic Citrus (full – RM19) to share and a slice of carrot cake (RM9) for dessert. 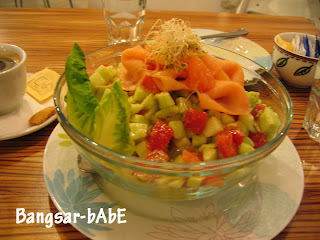 The salad was a combination of cherry tomatoes, sunflower seeds, grapefruit segments, cucumber and smoked salmon coated in light dressing. It tasted as beautiful as it looked. The dressing complimented the salad nicely, making it a satisfying experience. The star of the meal had to be the carrot cake. I’m very particular about carrot cakes. I love them dense and moist. Marmalade does it just the way I want my cakes to be. 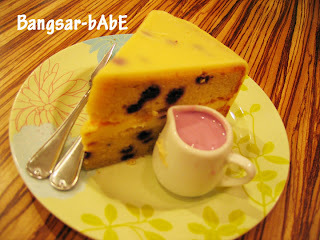 This blueberry yogurt cake(RM9) was ordered the week before this dinner. Jeen and I popped by Marmalade for dessert after our dinner nearby. The cake was rich and firm with generous bits of blueberry in it. Tasted a bit like sour cream cake with the poppy seeds replaced by blueberries. Service was pretty good as we had attentive waiters. It wasn’t a full house on both occasions though so I’m not sure if service is always this good. Its spacious, relaxed ambiance makes it ideal for catching up with friends and chilling out on lazy weekends. I like! Oh great BB, have you tried the food too- the Cameron Valley doughnut sandwich and mushroom chicken melt are simply de-lish!